Handcuff King. Escape Artist.International Superstar. Since his death eighty years ago, Harry Houdini has continued to captivate generations. Now, renowned magic expert William Kalush and best-selling writer Larry Sloman team up to find the man behind the myth, from the passions that drove Houdini to perform ever-more-dangerous feats to his secret life as a spy, and the pernicious plot to subvert his legacy. After years of struggling on the dime museum circuit, Harry Houdini got a break that thrust him into the spotlight -- performing for royalty and commanding vast sums. At a time when spy agencies frequently co-opted amateurs, Houdini went to London and developed a relationship with a man who would run MI-5; for the next several years, he traveled to Germany and Russia and routinely reported his findings. After World War I, Houdini set out to infiltrate and expose the seamy world of fake spirit mediums, triggering the wrath of a group of fanatical Spiritualists led by Sir Arthur Conan Doyle. Death threats became an everyday occurrence, but the group would pose an even greater danger to Houdini's legacy. 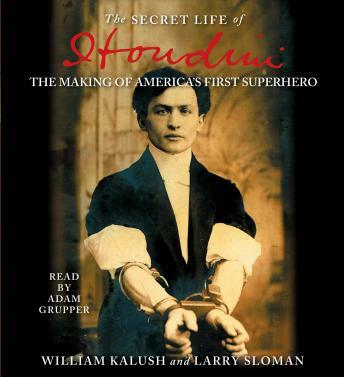 As exciting as any good thriller,The Secret Life of Houdini traces the arc of the master magician's life from desperate poverty to worldwide legend, and initiates the listener into the arcane world of professional magic.